Vanadium dioxide is poised to join the pantheon of superstars in the materials world. Already prized for its extraordinary ability to change size, shape and physical identity, vanadium dioxide can now add muscle power to its attributes. A team of researchers with the U.S. Department of Energy (DOE)'s Lawrence Berkeley National Laboratory (Berkeley Lab) has demonstrated a micro-sized robotic torsional muscle/motor made from vanadium dioxide that for its size is a thousand times more powerful than a human muscle, able to catapult objects 50 times heavier than itself over a distance five times its length within 60 milliseconds -- faster than the blink of an eye. "We've created a micro-bimorph dual coil that functions as a powerful torsional muscle, driven thermally or electro-thermally by the phase transition of vanadium dioxide," says the leader of this work, Junqiao Wu, a physicist who holds joint appointments with Berkeley Lab's Materials Sciences Division and the University of California-Berkeley's Department of Materials Science and Engineering. "Using a simple design and inorganic materials, we achieve superior performance in power density and speed over the motors and actuators now used in integrated micro-systems." Wu and his colleagues fabricated their micro-muscle on a silicon substrate from a long "V-shaped" bimorph ribbon composed of chromium and vanadium dioxide. When the V-shaped ribbon is released from the substrate it forms a helix consisting of a dual coil that is connected at either end to chromium electrode pads. Heating the dual coil actuates it, turning it into either a micro-catapult, in which an object held in the coil is hurled when the coil is actuated, or a proximity sensor, in which the remote sensing of an object (meaning without touching it) causes a "micro-explosion," a rapid change in the micro-muscle's resistance and shape that pushes the object away. The heating of the vanadium dioxide micro-muscle to actuate it can be done either globally with a tiny heating pad, or with an electrical current applied to the dual coil. 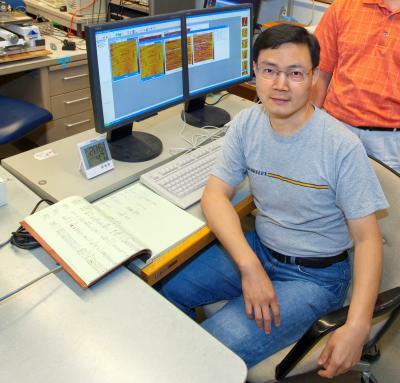 Wu says heating with the electric current is the better way to go because it allows for the selective heating of individual micro-muscles and the heating and cooling process is much faster. In addition, as vanadium dioxide absorbs light and coverts it into heat, the coil can also be triggered optothermally. "With its combination of power and multi-functionality, our micro-muscle shows great potential for applications that require a high level of functionality integration in a small space," Wu says. This work was supported by a DOE Office of Science Early Career Award to the University of California, Berkeley.